Jaipur is a traveller and shopper’s delight. 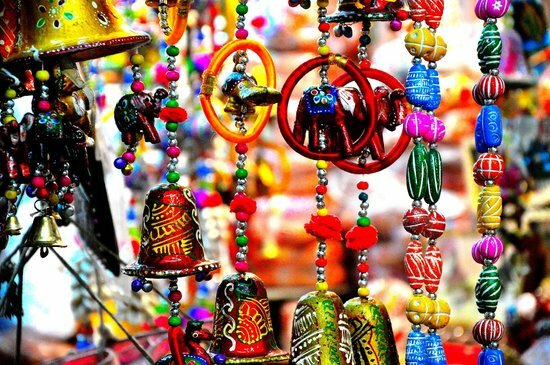 From beautiful fabrics to stunning jewellery, you’ll find the best of Rajasthani heritage in the markets here. It’s always great to visit this city. But this weekend, Jaipur will really come alive. The annual Jaipur Literature Festival begins on January 24 and will continue till January 28. If you’re going to attend this grand affair, you should take time out to explore the host city as well. Visit the forts and other historic sites, but don’t forget to do your share of shopping there. This is the most famous market of Jaipur, and anyone who visits the city has to make a stop here. 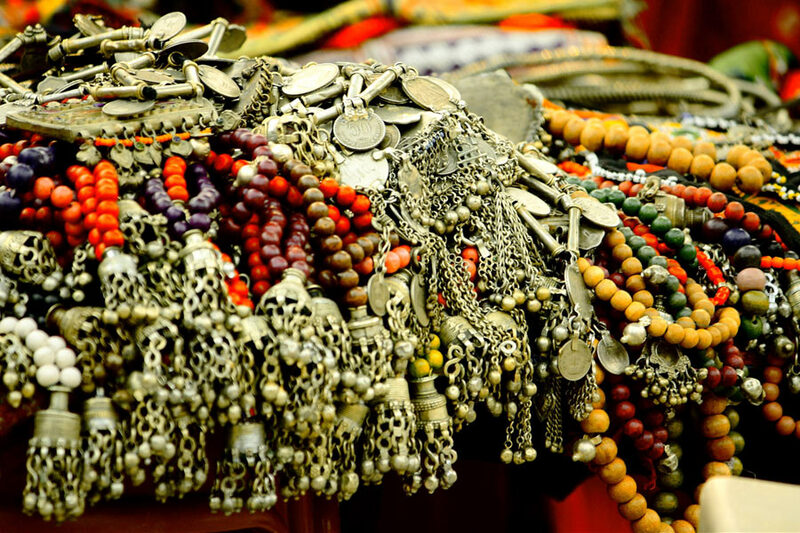 True to its name, Johari Bazaar has lanes and lanes of silver, gold, and typically Rajasthani jewellery. You will also find some of the best kundan jewellery in the country here. Jaipur’s craftsmen are known for their highly skilled artistry and their talent shows in the intricate work on display in this market. You can also find lehengas and sarees with delicate gold zari work in Johari Bazaar. If you’re in the mood for some serious shopping, you need to spend some time here. Johari Bazaar is about 3 kilometres away from Hotel Diggi Palace, the venue for the Jaipur Literature Festival. Famous for carpets, rugs, ironware, and the renowned lac bangles, Tripolia Bazaar is a vibrant, lively market in Jaipur. If you’re looking for a Rajasthani carpet, or a simple rug, you will find something here. Even as a tourist who doesn’t want to shop, this market is great for a leisurely walk. The colours and craftsmanship on display is absolutely stunning. Take a look at Maniharon Ka Rasta for a glimpse into Rajasthan’s history. This market is 3 kilometres, or 15 minutes away, from Diggi Palace. Pick up a range of woollens, jackets and other knitwear from Tibbati Market. This market is open only from November to January so now is the time to visit. You can also sample some of the best momos in north India here, along with some delicious pickles. This market is a little over 3 kilometres away from Diggi Palace. This is one of the markets in Jaipur where you will find everything. From Jaipuri sheets, furnishings, juttis and mojri shoes to shawls, skirts, and other clothing items, Bapu Bazaar has a lot to offer. Make sure you have enough room in your bags before you start shopping here. This market is located in the old city and is about 2 kilometres away from Diggi Palace. Located right next to the iconic Hawa Mahal, Badi Chaupar is hard to miss. You will find a wide variety of Jaipuri quilts here, which are perfect for summer nights in air-conditioned rooms. Give a lively, ethnic look to your bedroom with a few quilts from this market. Apart from this, you can also buy intricately-designed Rajasthani furniture, clothes, fabrics, and handicrafts here. If you’re a shoe lover, you must spend some time trying on the beautiful juttis available here. This market is about 3.5 kilometres away from Diggi Palace. If you like jewellery, you would have heard of Amrapali. While there are several outlets of this store across the country, there’s nothing like their original store. The exterior of the store in Jaipur is gorgeous and stands out like a crowning jewel in this busy city. Go to this store and enjoy being in the presence of Amrapali’s best work. This store is located in Tholia House, less than 2 kilometres away from Diggi Palace. 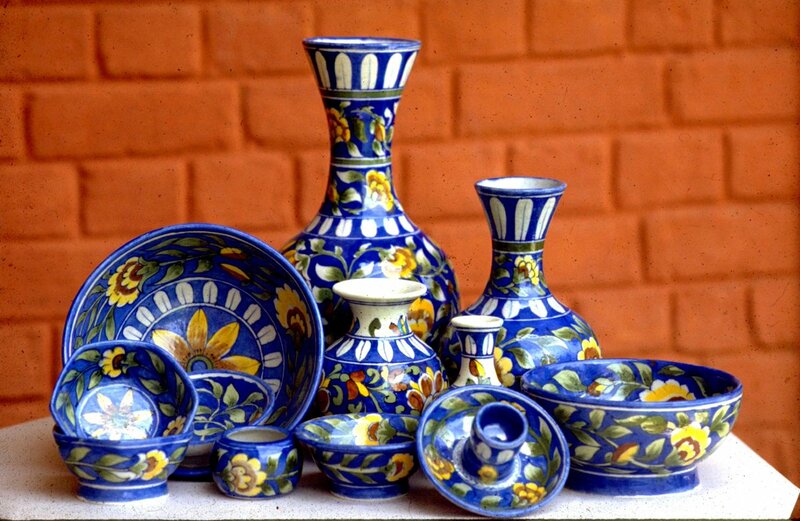 If you’re looking for authentic blue pottery, Kripal Kumbh is the place to be. Credited with saving a dying art, Kripal Singh Shekhawat started Kripal Kumbh in the 1960s. Walk away with enviable works of art from here. These pieces can brighten up any room. Kripal Kumbh is about 5 kilometres away from Diggi Palace. Read the fascinating history of Kripal Kumbh here. One of the most famous shops in Jaipur, Gem Palace has been run by one family for over eight generations. They have been known to serve the royal family of Jaipur too. Whether you’re a minimalist or a lover of everything opulent, you will find the perfect jewellery for yourself here. Even if you don’t want to buy anything, visit their store on MI Road to have a look at their exquisite collection. Gem Palace is about 2 kilometres away from Diggi Palace. Hop on a train, bus, flight, or cab, and get ready to shop till you drop in Jaipur. Once you’re done with JLF, click here for our 2019 travel guide for interesting events across India.